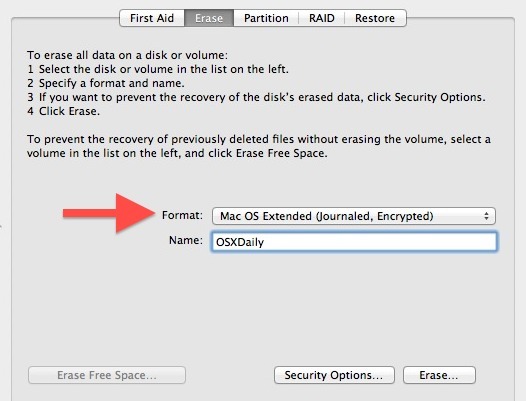 We recently showed you how to password protect files and folders using encrypted Disk Images in Mac OS X, but if you have an external drive you can go a step further. By using encrypted disk partitions, any drive, be it a USB key, flash drive, hard disk, or whatever else, can be set to require a password before the drive can be mounted and the files accessed. Doing this will format the external drive and erase all of it’s contents. Back up your data and all contents before proceeding, and do not lose the set password. Let Disk Utility run, when finished the drives partition will show up on the desktop, the drive will be accessible for now without a password allowing files to be transferred over. Eject the disk when finished to require a password upon further mounting and usage. Clicking on “Remember password in keychain” will allow the drive to be mounted on the Mac without entering the password on that Mac, but it will still require a password to be used on another Mac. For maximum security, it’s best to leave that option unchecked. For system-wide security measures, don’t forget to password protect a Mac with both login and screen saver passwords, and if you don’t mind the trade offs, to use FileVault to encrypt the entire hard drive and its contents. I’ve done this, but the problem that I see is that if I eject the partition, it doesn’t ask me the password again until either the drive itself is unmounted, or the computer is rebooted (which of course unmounts the disk). Is there any way to just CMD-E eject the partition and still have it ask for the password? Good topic. Can you educate us further how I can use this encrypted drive when I am reading or writing to a windows machine? Any way to do this without erasing the partitions of a drive? I tried encrypting an external 320GB EIDE drive, after erasing the drive. It took only a couple of minutes for DU to finish but then the drive would not mount. I waited about 10 minutes and finally rebooted the system. Did I not wait long enough? Upon reboot, the password entry box came up, I entered my password and got an error that the drive was unreadable. I clicked on the “Initialize” option that I was presented with and DU opened but it was unable to re-initialize the drive. It took booting into my BootCamp partition and using the Windows XP Disk Management system to perform a low-level format on the drive. I created a Windows partition on the drive and when I booted back into Lion, the drive mounted. I opened DU and was able to re-partition the drive with a GUID and format it unencrypted. It now works fine again. I don’t have the “Encrypted” option alongside the “Mac OSX Extended (Journaled)” option. In total I have 6 options, but none of which have the ability to encrypt. I tried making a new image on the drive since at least THAT one has the option (I chose 128 bit), but then it says “invalid argument” and doesn’t make a new image. I really just want a basic password on my external HD so that the average joe won’t be able to accidently plug it in and sift though it. I’m running 10.6.8 btw. What am I missing? It’s only available in Lion 10.7+. You’ll have to upgrade. Since you need Lion 10.7+ for that option, will machines running older versions of osx be able to interact with the encrypted drives? i passworded my external hard drive using this method. the problem now is i did a clean installation after i upgraded to mac osx lion. now the computer does not detect the hard drive. what do i do? Guys, try Lockngo. No need to prepare drive or reformat it. Very fast disk locking. It works for both Mac and PC. 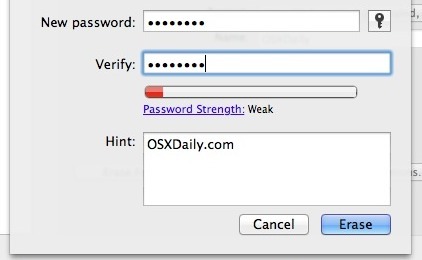 i used this but now my mac doesnt prompt for password anymore and i cant format it using disk utility. I searched for a few hours online to find out how to add a password with encrypted partitions and every other source didn’t help much. I followed your steps and it works great! Thanks so much for the screenshots as well. It helped a bunch! I DID AS ITS SAID ON THE TEXT NOW I LOST ALL MY DATA ON THE EXTERNAL HARD DRIVE ICANT SEE ANYTHING ??? HELP PLZ ? Were you able to find a way to recover it? Thanks for your detailed explanation. I was wondering if I can encrypt/password protect only some of my partitions. Or protect each partition with a different password. My drive(Seagate 2TB) is attached to the router WD Mynet N900. Hi, Is it possible to set different passwords for different partitions. I’m talking about network drive. Great, but how do I remove the password protection from a drive I don’t want to be encrypted? Ok, so it’s set… can it be changed? I recently purchased a new external to use with a Mac (that’s on loan). I set up the external with that Mac and put all of my information on it. It’s pw protected which I wanted, but now I want to change the pw now. And also I can’t use it on any other type of computer but a Mac. Someone was helping me set it up, so something must have been done to cause this, but I wouldn’t know what. Still actually learning how to even use a Mac. I love my external and of course need it to work with my Mac and need it pw protected, but need it to work with any computer I hook it up to. What do I do? Thank you. Hello, i have tried to do this but when i go onto Disk Utility there is no option to encrypt? help please! Is it possible to partition an external hard drive and then password protect only one of the created partitions? this may sound dumb but i thought this method will only put a password on my external hard drive. but i think i deleted all my files on my external hard drive :”( I was just trying to put a password on it. is there anyway i can get my files back? That should work fine, the drive is still there it just needs to be authenticated again. You should be able to select the drive in Disk Utility, then go to the ‘File” menu and choose “Unlock” on the encrypted partition. Starting to get into the weeds with that one, but it would work as well. Try to use Disk Utility if possible, it’s much easier. Yes this is for Mac, Mac OS is not Windows. Encrypts the partition for Mac. I forgot my external drive password. what can i do?? how to format disk to recover the password?? Please help me! !